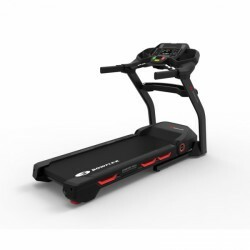 The Bowflex treadmill BXT226 is equipped with a 3.75 HP motor, offers pre-installed training programmes according to the MAX principle, and is very sturdy. It transmits easily the data to other Fitness Apps as for instance RunSocial, MyFitnessPal or GoogleFit. Sometimes you have to consent to compromises with a treadmill, for instance. Do I want a treadmill with folding mechanism or do I want to buy a treadmill that offers me a maximum stability with heighest weight load. This compromise is no longer required thanks to the Bowflex treadmills. The machines are folding and are extraordinarily loadable with a maximum user weight of 172 kg respectively 181 kg. Both Bowflex treadmills are equipped with strong motors. Hence the treadmill is very constantly moved even at high speeds. 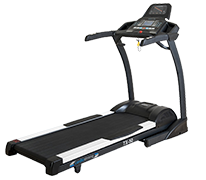 In order to ensure a safe and comfortable achieving of these high speeds, the Bowflex treadmills are equipped with big running surfaces of 150 cm in length at least. The consoles are well-thought out and versatile. Almost any programme can be chosen at the touch of a button. Changes in speed and incline can also be quickly done via the hot keys during the training session. The consoles can also be connected with Apps - hence you can record your training prograess and watch again your success.